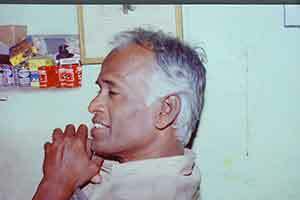 This new center for meditation for Doctor’s disciples was inaugurated on 19th January, 2008 in T.Nagar, Chennai,Tamilnadu. It is a common practice for all disciples to gather in their houses or in one of their co-disciple’s house for any kind of get-together, celebration, spiritual discussion, Satsangs etc. in Chennai. Doctor has provided this place for practicing meditation every day between 5-30 am and 9-30 pm. It is open for doctors dissciples to go there, sit and meditate. The difference between other places of meditation and this place is experienced by all, ever since the doors were open on 19th February. The vibration sets in instantaneously. It is calm…peaceful…no disturbance is felt here. Without an exception everyone feels the presence of Doctor, our Master here. It is common knowledge that meditation is a method to reach one’s domain. It happens here without any effort. Holy beings are always present here to help us in meditation; not that it does not happen when one sits at home or other places but other places are meant for other activities also, besides meditation. This place is exclusively established for the purpose of meditating and seeking the Truth. I am confident that we all feel the same way. So…. This place is Special. What is domain in the yogic parlance? It is our original living place. All our efforts are to reach that secure place. The fruit of meditation is to establish us at this place permanently. Nothing can perturb us when we are in our domain. One can call one’s house the domain for his family. That is okay for a common man. Where is the domain for the spiritual practitioner? The domain for a yogi .......Siddha is between his eye brows. That is the seat of Guru….Master. This is the place where karma is burned when the Gathi or Prana activated by the Guru is raised up to this point. What does one get by meditating at Thamarai instead of ones own cozy comfortable and most loved home? Well, if one goes to Thamarai, one gets charged, peace descends, karma burns, by the grace of the holy beings present spiritual path is cleared of obstacles and progress made easy for the disciple. The main benefit is faster progress in spiritual path. The name Thamarai is the Tamil word equivalent to English word Lotus. 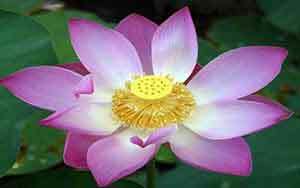 Among flowers Lotus is a frequently reffered symbol in the spiritual realm. Gods, Godeses and evolved beings are visualised as seated on Lotus. It is often compared to the feet of Guru and God. In spiritual parlance, thousand petalled (sahasraram) lotus is the one where God is seen as light by blessed souls. It is said in Kundalini yoga that Kundalini passes through several lotuses with different number of petals along the path of Sushumna nadi (in the reigon of spinal chord) and reaches Ajna charka. The path ends at the thousand petalled lotus where the supreme power is seated. The choice of name is apt, no doubt. Of all the miracles that Doctor had performed in the years of my association with him, I think the change that he brought about in his disciples is the most powerful and remarkable one. He is an enigma like his ways. We cannot predict his moves but we can utilize the facilities that he provides for us. We must make it a point to visit Thamarai as frequently as possible to meditate and experience our domain.